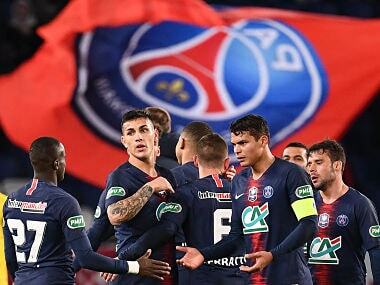 Paris: Paris Saint-Germain squandered the chance to clinch the Ligue 1 title in record-equalling time on Sunday after a 2-2 draw at home to Strasbourg, with Eric Maxim Choupo-Moting's incredible miss from on the goal-line costing his team dear. PSG were handed the opportunity to win their sixth French crown in seven seasons after second-placed Lille drew 1-1 at Reims earlier. That left Thomas Tuchel's side knowing that three points at the Parc des Princes would see them retain the title and wrap it up with eight games to spare, matching the speed with which Laurent Blanc's team became champions in 2016. 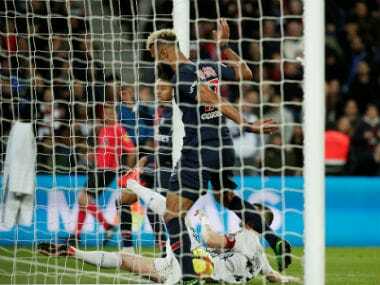 Choupo-Moting gave them an early lead with his third Ligue 1 goal, but later in the first half he somehow succeeded in turning a net-bound Christopher Nkunku shot onto the post while standing on the line. "I wondered if I was offside and it all happened very fast. I touched the ball, it hit the post and, well, it's a real shame because the ball was going in," Choupo-Moting told Canal+. Fresh from winning the League Cup last weekend, Strasbourg had equalised prior to Choupo-Moting's howler when Nuno Da Costa turned in a Lionel Carole cross, and they found themselves 2-1 up in the 38th minute when Anthony Goncalves lashed home from 22 yards. Kylian Mbappe came off the bench on the hour mark but it was another PSG substitute who made it 2-2 with eight minutes remaining. Julian Draxler sent in a corner from the right and Germany defender Thilo Kehrer headed home. However, having drawn at home to PSG back in December, mid-table Strasbourg then held on for a point. Cameroon international Choupo-Moting started with Mbappe rested and Neymar, Angel Di Maria and Edinson Cavani all unfit -- the latter watched from the stands sporting a beret. 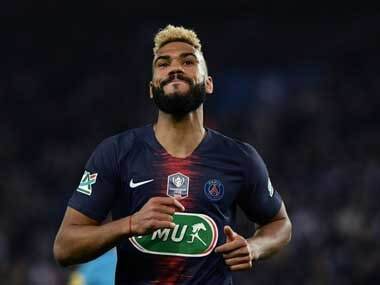 "He is an excellent back-up player to have but if you start a lot for PSG you need to have confidence and he lacks that," said Tuchel of Choupo-Moting. "He was very unfortunate because he started very well and then he stopped that ball on the line which would have made it 2-1 for us. "I don't know why he did that. In English you say it's Murphy's law." A point will be enough in that game, but PSG should have finished the job here -- Choupo-Moting's miss was one of the worst you are ever likely to see, while Dani Alves hit the bar after the break. Earlier, Jose Fonte's 56th-minute header had Lille on course to take all three points away to Reims, but substitute Remi Oudin's 78th-minute leveller -- initially ruled out for offside but then given after a VAR review -- denied the visitors. Lille are more concerned with holding off the teams below them as they look to secure second place, which provides automatic qualification for next season's Champions League group stage. The draw at the Stade Auguste-Delaune moved them five points clear of third-placed Lyon, who slumped to a shock 3-1 loss at home to relegation-threatened Dijon on Saturday. "If we had won I think we would have sealed our place on the podium," said Lille coach Christophe Galtier. "We are 11 points ahead of Saint-Etienne but there are still 21 points to play for." Fourth-placed Saint-Etienne drew 2-2 at Amiens on Saturday, while Marseille, in fifth, were beaten 2-0 at Bordeaux on Friday. Reims are just a point behind OM in sixth and are level on points with Patrick Vieira's Nice, who beat Montpellier 1-0.